Employees who develop a severe latex allergy may have life-threatening reactions. How an employer handles the problem of latex allergies can make a significant difference in a workers compensation case. In part 1, I detailed the many household and healthcare products that contain latex. In the examples that follow, I explain how the symptoms are associated with gloves. Allergic contact dermatitis is a reaction to the chemical additives used during the latex manufacturing process. It consists of blisters and flaking skin and looks like a poison ivy rash. It begins 1 to 3 days after wearing gloves. Anaphylactic reactions may occur, although they are rare and not the first sign of a latex allergy. In this condition, the person’s face, lips, and throat begin to swell shut. The person may have difficulty breathing, wheezing, drop in blood pressure, confusion, loss of consciousness, and a rapid or weak pulse. It is a medical emergency and can result in death if the person does not receive immediate help. Latex allergies are diagnosed by an allergy blood test. A patch is also available. The patch contains latex additives and is applied to the skin and checked over several days. A positive reaction is shown by itching, redness, swelling or blistering where the patch covered the skin. There is some risk associated with this testing so it should be done under close supervision by a qualified allergist. The best treatment for latex allergies is avoidance. The employee should inform the employer, wear medical alert identification and carry an epinephrine auto-injector to use for emergency treatment. The employee should learn how to use it and make sure family members, friends, and fellow employees know how to use it. Avoidance of latex gloves and products is necessary. The employer should supply non-latex gloves to all employees, not just the one with the allergy. gloves release latex into the air when they removed. A latex-allergic person may have an anaphylactic reaction simply from inhaling the powder used someone else’s latex glove. One of the ways to control latex allergies is to practice good housekeeping: housekeepers can remove latex-containing dust from the workplace using HEPA vacuums. They should focus on cleaning upholstery, floors, carpets, and ventilation ducts. In a healthcare setting, some areas of the hospital may have a high usage of latex and require thorough cleaning: operating rooms, intensive care unit, dental suite, nurseries, emergency department, and x-rays department. As a result of the prevalence of latex allergies, many healthcare facilities have switched to non-latex gloves or low protein latex gloves. Don’t be fooled by the term “hypoallergenic gloves”. They do not reduce the risk of latex allergy. They may reduce reactions to the chemical additives in the latex. This website provides a list of some non-latex medical products. 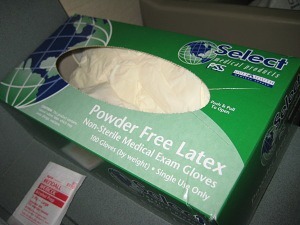 Many healthcare facilities are creating latex-safe areas to accommodate people who are allergic to latex. Some employees who have had anaphylactic reactions to latex have been urged to return to their jobs without appropriate safeguards being in place. This is gambling with someone’s life. An anaphylactic reaction may be a killer. The Americans with Disabilities Act covers people with severe allergies to latex. Employers must make accommodations for the individual. They are obligated to provide training for workers on latex allergy and promptly arrange for a medical evaluation for workers with symptoms of latex allergy. In severe cases, as I shared in part 1, an employee may be forced out of the workplace and confined to home, unable to work and function normally. Careful attention to the risks of latex allergy can save lives and avoid the crippling effects of people who are forced out of their occupation due to a severe allergy. Read part 3 for insights into how a latex allergy may result in a medical malpractice case.